A giant banner reading "Leave it in the ground" has been draped over the train bound for Drax near Selby. The train was stopped in Rawcliffe, on the border of North and East Yorkshire. A protester said lines had been attached to the train's wheels to stop it moving. He said the intention was to start unloading coal using shovels. One of the activists said the freight train was stopped using a red flag. The protest is being staged by members of Leave it in the Ground, a group which campaigns against open cast mining. In a statement released by the group, the activists said they had enough supplies to remain on the train for several days. Members said they would not move unless the chief executive of Drax personally explained to them how the power station's emissions were compatible with tackling climate change. In the statement the group said they had used a "carefully rehearsed procedure to stop the train". 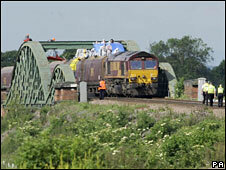 Members said signalmen were informed as soon as the action was under way in order to prevent any risk to other trains. 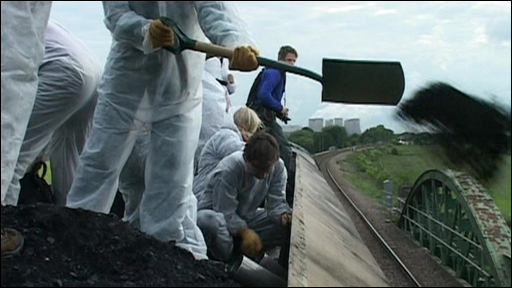 Activist Ben Tennyson said: "We've stopped this train to prevent it delivering a thousand tonnes of coal to be burned at Drax and then released into the atmosphere. "If we're serious about fighting climate change we have to leave this dirty fuel in the ground and invest in clean, renewable energy sources instead." Drax is part of the publicly owned Drax Group which floated in 2005 and is now among the top 250 companies listed on the London stock market. A spokeswoman for Drax said the protest would not impact on operations and the station would operate "business as usual". A statement from Drax said: "We are the largest, cleanest and most efficient coal-fired power station in the UK, which means that for every unit of electricity we generate we emit less CO2 than any other coal-fired power station in the UK. "It is simply our size that makes us the single largest source of CO2 emissions. "We are investing £180m in reducing our emissions of CO2, through improving our thermal efficiency and co-firing renewable biomass materials. "Together those two initiatives will reduce our carbon footprint by 15% or over three million tonnes. "We are making a difference today by reducing our CO2 emissions, whilst delivering reliable and secure supplies of electricity." A North Yorkshire Police spokeswoman said: "We've been aware that there are a number of protesters at Rawcliffe. "British Transport Police and North Yorkshire Police are responding at the scene."